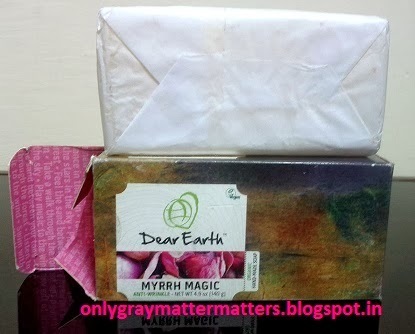 This is a review of Dear Earth Myrrh Magic Anti-Wrinkle Soap from Unived. I had earlier reviewed their Bamboo Charcoal Soap (Read Here), which was a big hit for me. Just like most women dream to own all the makeup in this world, my high comes from trying different bath and personal care products with least chemicals. Availability: unived.in (brand website, 10% discount), greenngood.com (9% discount), healthkart.com (5% discount), naturalmantra.com, beautykafe.com, Limeroad.com, snapdeal.com etc. Can a soap actually be anti-wrinkle? My understanding is that an anti-wrinkle product needs to stay for a good amount of time on your skin (like a cream or lotion) to nourish it and fight wrinkles, or be gently exfoliating to remove dead cells and reveal fresh new skin while promoting cell regeneration. Did this soap deliver on its claims? Read on. "Indulge yourself in the fiery romance of irresistible myrrh and velvety rose petal which effectively tone your skin and bring back its youthful vigor. The moisturizing goodness of Shea butter sinks deep into the skin for hydration through the day. 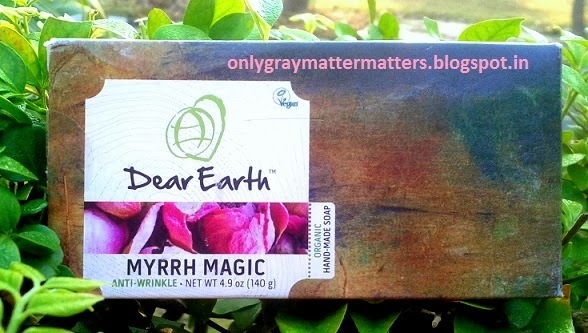 Dear Earth Myrrh Magic soap is made to smooth out the wrinkles, lines and sags on your skin." Bacopa Monnieri (Brahmi) promotes cell generation giving you healthy skin, hair and nails and is helpful in a variety of skin conditions like eczema, psoriasis etc. Like Brahmi, Chamomile also repairs dry, damaged skin by accelerating the healing process of skin. Both of these soothe itching and skin infections. As it contains EDTA, it does not leave any residue on the skin or soap scum in your bathroom (you can read in detail in the bamboo charcoal soap review). 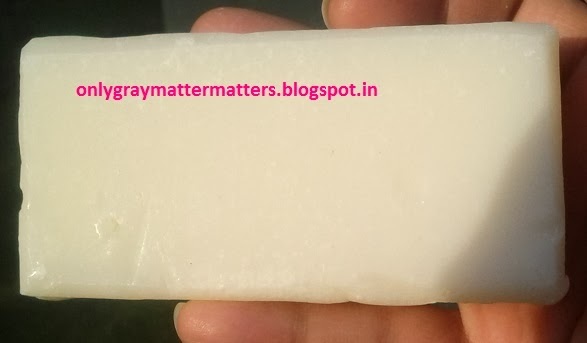 Unived soaps are NOT organic as any product claiming to be organic needs to have an organic certification. Unived soaps are just registered as Vegan but don't have an organic certification as they contain EDTA, a chemical, as a preservative. I have explained this in detail in their Bamboo Charcoal Soap review HERE. 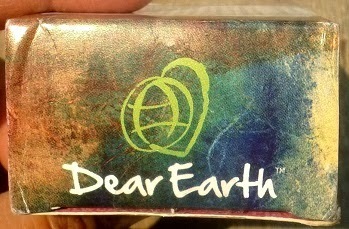 Dear Earth Myrhh Magic Anti-wrinkle soap looks exactly like a beautiful bar of white wax. I had started using this one before the Bamboo Charcoal soap, but initially it was drying my skin. The reason it did not suit me initially could be because all handmade soap bars harden in winters. I cut it into 2 pieces. One fell from my hand and chipped off slightly, being hard. After a few uses when the soap softened, the oils in it started working and did not dry me out anymore. It lathers super creamily. I just need to swipe it once on wet skin and it leaves my skin squeaky clean. It rinses off easily too with very little water. One thing that caught my sudden notice in the very first use is that you feel a sudden tightening of skin when it is on. During my first bath, I was surprised with the tightening effect because when you use harsh chemical soaps, they dry your skin and you get the same tight stretchy feeling. But when I rinsed off this soap and patted dry, the skin was perfectly fine. So it took me a little while to understand that the tightening feeling is because of its toning effect on the skin. I guess it does deliver on its claim to tighten saggy body skin. Talking about the anti-wrinkle effect on the face, I don't think any soap can do that. But I do use this soap on face once every 3-4 days (just one swipe) and I get the same squeaky clean effect as the Aroma Magic White Tea and Chamomile face wash. If I keep it on my face for long or rub it, then it slightly dries my skin. It never broke me out. Those with oily skin or oily t-zone would understand that when we use a harsh cleanser on the oily area, the oil glands rather produce more oil and leave an unhealthy shine (like shiny nose in summers). One major difference I noticed is that this soap does not cause any unhealthy shine on my oily t-zone. Let's see how it fares in summers. 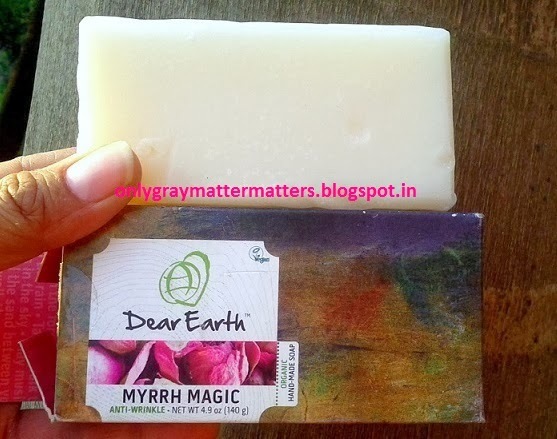 Myrrh Magic soap effectively removes any body odor and sebum. It has a beautiful aroma, which is sharper than the bamboo charcoal soap's fragrance. Especially in winters, the aroma locks into your skin under the layers of clothing. Because it contains rose oil, it is more suited for normal to oily skinned people. My personal experience from using many personal care products is that shea butter alone does not work for dry skin, but shea butter + jojoba oil combination works very well. Their Bamboo Charcoal soap has both. 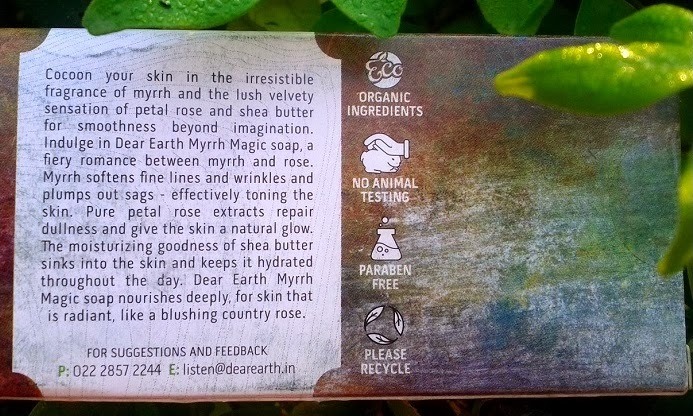 So, the moisturization provided by the Myrrh Magic soap is not as intense as their Bamboo Charcoal soap. I have dry, sensitive skin and it is extremely cold here. While it does not leave my skin dry or stretchy, I feel the need for a moisturizer after 2 hours of bath with this soap in winters. I use multiple bath products and have saved the second piece of this bar for using Mar onward when the weather changes. If you are working and want a quick 2 minute spa-like bath every morning, this is the soap for you. Dry skinned people, try it in spring or summers. I am certainly going to try the Bamboo Charcoal one.. not sure about this one. Let's see. and hey, what does it smell like? Just noticed that I missed answering these comments. This one does have strong notes of country rose (desi gulaab) which smells lovely but the fragrance is modified by Myrrh and I don't know how Myrrh smells alone. But if you sniff the bar, the fragrance shoots right through to your head. On the body, it is not smell strong or heady and locks beautifully in the skin for several hours. But yes, I also prefer Bamboo Charcoal one over this. Wow this sounds really good. Great review Gagan! this one looks good too... and abt the anti wrinkle property.. i am not too sure too! Thanks Supriya. Even I used to think soaps can never be anti-wrinkle and I couldn't imagine the anti-wrinkle effect on the body skin before using this one. But this does tighten the skin. You should get the same and much higher effect if you massage brahmi essential oil mixed in any carrier oil, on the body directly. but i was wanting to try the charcoal soap the most. I can hear your excitement Apoorva :) Yes, I also noticed that the brand has now started sending out samples to bloggers and have recently seen these reviews on many blogs. May be this review opened up their eyes to a whole new way of spreading the word of mouth. Thanks for the feedback Meenakshi. Yes it is quite creamy and there is no chance of breaking out because it contains skin soothing Brahmi and Chamomile. However, it badly dries out my facial skin so am waiting for the weather to go a little more warmer before trying the other half of this soap.